The Rogue Legendary Loa has just been unveiled! The reveal was made by MKRR3 on YouTube. The video is in Polish. 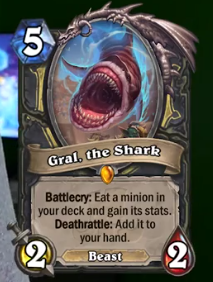 Gral, the Shark can potentially draw you a minion but it is quite weak to Silence. Still, Rogue has quite a few ways to trigger the Deathrattle and now with Spirit of the Shark, it can trigger the Battlecry twice as well. At first sight, though, it feels like a weak card: Silence destroys it, high mana cost and Rogue traditionally runs quite a few small minions as well. It also doesn't seem to fit with the Pirate theme Rogue will have in Rastakhan's Rumble, altough perhaps we can see Beast Rogue with Oondasta and the recently revealed Untamed Beastmaster. What do you people think about this card? Well, this is definitely a strange Battlecry. Could be fun to built a meme-deck around this. But in the end I can't really imagine how someone could get any more value out of this then an expensive Mountain Giant that draws a card when it dies. Even in the best possible case you just get a bunch of stats and draw one or two minions...thats pretty much a slower, bigger and more unreliable version of Elven Minstrel. How is it a tutor effect? Do you get to choose the minion it eats? Doesn’t seem like it from the text. That’d be insane on curve. 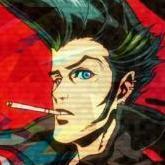 As it is, seems pretty weak to me. Also does ‘gain its stats’ mean just the attack and health? Even with spirit of the shark, you could just end up with a 5 mana 2/8 unless you’ve drawn both spirits. And playing Turn 4 shark, Turn 5 gral into enemy spellbreaker is pretty much game over against anything vaguely aggressive. Yeah, sorry, when I saw the card, I thought you got to choose but you don't. It's just random. And yeah, just attack and health. I kind of like it, miracle rogue runs mostly 3/3s and above. A 5 mana 5/5 draw a card for 5 is great. Probably depends on how much silence is teched into the meta. pretty cool way for maly rogue to get maly or illusionist into the hand, maybe even more than 1.